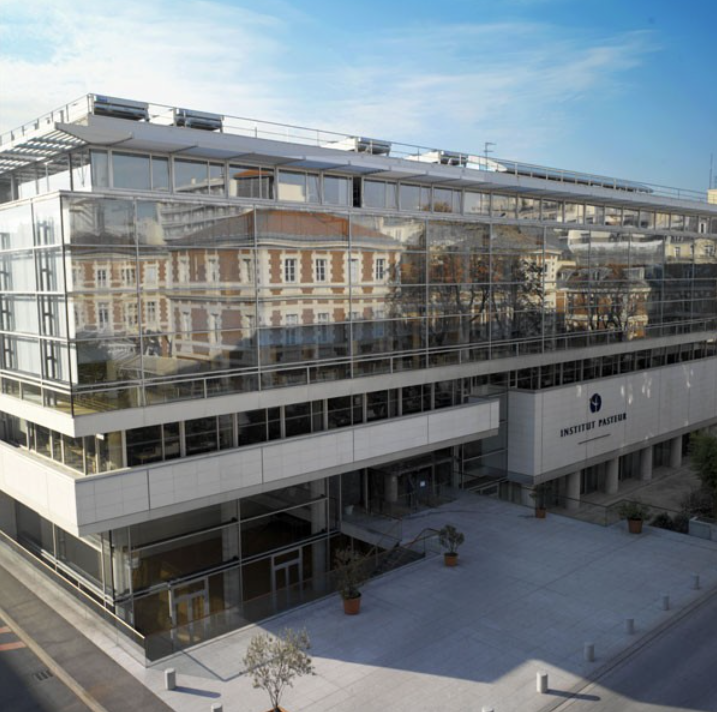 The International Society for Transgenic Technologies (ISTT) will proudly co-sponsor the CARD – IP Mouse Sperm and Embryo Cryopreservation Course that will be held at the renowned Pasteur Institute, in Paris, on 20-24 June 2016, organized by Naomi Nakagata (CARD-Kumamoto University, Japan, Coordinator of CARD) and Jean Jaubert (Pasteur Institute, Paris). Recent developments from the laboratory of Prof. Naomi Nakagata (CARD-Kumamoto University, Japan) have pushed the envelope of mouse cryopreservation: i) improved female superovulation method; ii) fresh, frozen and cold storage sperm techniques; iii) optimized IVF methods. These improvements (see main references in program) have resulted in an unparalleled increase in efficiency of cryopreservation and rescue of relevant mouse lines. The aim of this course is to introduce the newest CARD methods to researchers and technicians involved in mouse archiving and/or managing transgenic facilities and who are willing to implement these new methods in their work. These techniques will be taught directly by the team that devised them. This course is open to anyone interested. Pre-application will be required, including, at least, a recent CV and a letter prepared by the intended participant describing how the applicant will benefit by attending this course and how relevant is the course material to his/her work. Additional documents are welcome, at the discretion of participants, including supporting letters by supervisors (where appropriate), reference letters, etc… A copy of the passport is mandatory. Applications should be submitted online, and will close on March 25th 2016. The maximum number of participants attending this course will be 20, distributed among countries and institutions, and according the documentation provided and the interests expressed. Review and selection of participants will be done by the Teaching Committee and results will be communicated by April 15, 2016. The official language of the course will be English. In addition to practical sessions, the course will also include several lectures of related interesting topics for the participants delivered by experts in each field. The International Society for Transgenic Technologies (ISTT) is pleased to announce the awardee for the 4th ISTT Young Investigator Award, generously sponsored by ingenious targeting laboratory (iTL). ISTT created the Young Investigator Award, with one goal: identify and recognize young scientists who will keep the field of transgenic technologies vibrant with new ideas and innovative research. After careful evaluation of the nominated candidates, the Award Evaluation Committee unanimously selected Dr. Pablo Ross (Department of Animal Sciences, University of California, Davis, CA, USA). Pablo is perfectly fitting with the criteria required for this price. Veterinarian by training, gaining his initial degrees in Argentina, he has obtained his PhD in 2007 from the Michigan State University in the Laboratory of Cellular Reprogramming. In 2009 he joined the Department of Animal Science of the University of California Davis where he is running his own group and has obtained this year an Associate Professor position. Pablo presents as a young, energetic and very talented individual. We are convinced that his research will considerably impact the field of large animal transgenesis. His specific niche is that of livestock embryo technologies and stem cells in which he is working by combining studies in a wide range of livestock species – cattle, sheep, horses and pigs. Among his key findings is the derivation and more importantly maintenance of iPS/ES-like cells in livestock species, a domain where the mouse methods are not always applicable. In parallel he is active in producing and characterizing novel gene edited and transgenic livestocks using for instance the CRISPR/Cas9 technology, and has more recently developed new approaches for interspecies blastocyst complementation, combining primate stem cells and livestock host embryos. 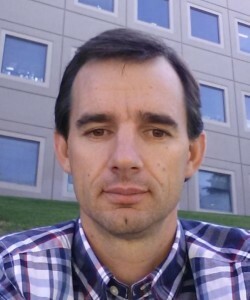 Dr. Pablo Ross will attend the next 13th Transgenic Technology (TT2016) meeting in Prague (Czech Republik, 20-23 March 2016) where he will receive the corresponding diploma and will deliver a talk summarizing his scientific achievements and giving us a unique opportunity to hear and learn more about the major recents achievements of the pioneers and current key players in the field. For the first time the ISTT will be awarding the Young Investigator Award to a scientist belonging to the group of molecular biologists and geneticists working with livestock animals and dealing and investigating with non-rodent species. In fact, they concentrate their work on species which have an obvious and increasing potential impact in our Society, namely species that we eat, that better match our human physiology and can be used as models that can be better utilized for the understanding and treatment of human diseases. The following articles represent some of his recent findings published in the last years, highlighting his most recent contributions to the field. 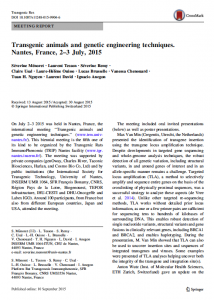 These publications have had a tremendous impact in the animal transgenesis field. Ferré LB, Bogliotti Y, Chitwood JL, Fresno C, Ortega HH, Kjelland ME, Ross PJ. Comparison of different fertilisation media for an in vitro maturation/fertilisation/culture system using flow-cytometrically sorted X chromosome-bearing spermatozoa for bovine embryo production. Reprod Fertil Dev. 2015 May 13. doi: 10.1071/RD15019. Choi YH, Ross P, Velez IC, Macías-García B, Riera FL, Hinrichs K. Cell lineage allocation in equine blastocysts produced in vitro under varying glucose concentrations. Reproduction. 2015;150(1):31-41. Buell M, Chitwood JL, Ross PJ. cAMP modulation during sheep in vitro oocyte maturation delays progression of meiosis without affecting oocyte parthenogenetic developmental competence. Anim Reprod Sci. 2015; 154:16-24. Bakhtari A and Ross PJ. DPPA3 prevents cytosine hydroxymethylation of the maternal pronucleus and is required for normal development in bovine embryos. Epigenetics 2014; 9(9):1271-9. Iqbal K, Chitwood JL, Meyers-Brown GA, Roser JF, Ross PJ. RNA-Seq Transcriptome Profiling of Equine Inner Cell Mass and Trophectoderm. Biol Reprod. 2014; 90(3): 61. Arias ME, Ross PJ, Felmer R. Culture medium composition affects the gene expression pattern and in vitro developmental potential of bovine somatic cell nuclear transfer (SCNT) embryos. Biol Res. 2013; 46(4):452-62. Burruel V, Klooster KL, Chitwood J, Ross PJ, Meyers SA. Oxidative Damage to Rhesus Macaque Spermatozoa Results in Mitotic Arrest and Transcript Abundance Changes in Early Embryos. Biol Reprod. 2013; 89(3):72, 1-11. Bogliotti Y and Ross PJ. Mechanisms of histone H3 lysine 27 trimethylation remodeling during early mammalian development. Epigenetics. 2012; 7(9):976-81. Kujjo LL, Ronningen R, Ross P, Pereira RJ, Rodriguez R, Beyhan Z, Goissis MD, Baumann T, Kagawa W, Camsari C, Smith GW, Kurumizaka H, Yokoyama S, Cibelli JB, Perez GI RAD51 Plays a Crucial Role in Halting Cell Death Program Induced by Ionizing Radiation in Bovine Oocytes. Biol Reprod. 2012; 86(3):76. The 2016 ISTT Young Investigator Committee was formed by Jan Parker-Thornburg (President of ISTT), Dr. Benoît Kanzler (Vice-President of ISTT, Chair), Dr. Paul Sheiffele (iTL CEO) and Dr. Lluis Montoliu (previous ISTT President). Dr. Ross was nominated by ISTT Member Dr. Bruce Whitelaw (The Roslin Institute, University of Edinburgh, Scotland, UK). ISTT early registration/renewal OPEN for 2016 ISTT membership! The International Society for Transgenic Technologies (ISTT) is pleased to announce that early registration or renewals are OPEN for 2016 membership! We already start accepting membership for next year! By joining/renewing early, you will have the added benefit of extended ISTT membership for this time period AND the following year (Jan-Dec). With an ISTT membership, you will have the opportunity of discounted registration for meetings that are hosted or sponsored by the ISTT. We also invite you to register for our upcoming 13th Transgenic Technology (TT2016) meeting in Prague, Czech Republic, 20-23 March 2016. Other membership benefits include access to our extensive picture and video libraries of transgenic techniques, registration to the ISTT list and free online access to Transgenic Research. On our homepage, you will be able to regularly review our recent Tweets and Blogs to keep you up to date with the recent activities of the ISTT and breakthrough transgenic technology news . Please don’t delay so that you can receive the additional benefit of three months of membership starting today! Go to the link: http://www.transtechsociety.org/join.php and join us! In all cases we will prepare and return the corresponding invoice. If you need an invoice in advance, please contact us at: registration@transtechsociety.org. Author Benoit KanzlerPosted on October 14, 2015 October 14, 2015 Categories registrations/renewalsLeave a comment on ISTT early registration/renewal OPEN for 2016 ISTT membership! The International Society for Transgenic Technologies (ISTT), in collaboration with ingenious targeting laboratory, has established the ISTT YOUNG INVESTIGATOR AWARD that is presented at each Transgenic Technology meeting. 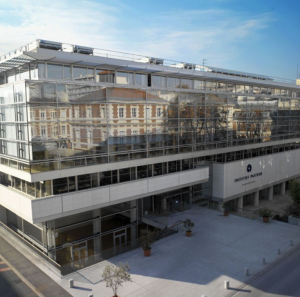 The fourth edition of this ISTT Young Investigator Award will be given at the next 13th Transgenic Technology Meeting (TT2016), that will be held in Prague, on 20-23 March 2016. The ISTT Young Investigator Award recognizes outstanding achievements by a young scientist who will keep the field of transgenic technologies vibrant with new ideas and who has recently received his or her advanced professional degree. The ISTT Young Investigator Award is generously sponsored by ingenious targeting laboratory. To date, the ISTT Young Investigator Awards has been granted to Dr. Xiao-Yang Zhao (TT2011), Dr. Toru Takeo (TT2013) and Dr. Feng Zhang (TT2014). The ISTT Young Investigator Award is associated to funds that will serve to defray the costs related to the participation of the ISTT Young Investigator awardee at the corresponding TT Meeting, including: TT meeting registration fee, travel expenses to the TT meeting venue and accommodation during the meeting dates for the awarded candidate, with a maximum being set to 1500 Euros. All ISTT Young Investigator awardees will be given 1 year Ordinary ISTT Membership and a diploma, that will be provided at the ISTT Awards Ceremony, within the TT Meeting Program. Instructions for participating and additional information are provided at the ISTT Young Investigator Award web page, within the ISTT web site. Nominees must be active in research, in the field of transgenic technologies, at the time the award is given. Nominees must have received a PhD or MD (or equivalent) within the past 10 years. Nominations must be made or endorsed by an ISTT member. Nominee does not have to be an ISTT member. Self nomination is not permitted. No person may nominate more than one candidate. Currently we are accepting nominations for the 4th ISTT Young Investigator Award for the TT2016 meeting in Prague. DEADLINE for submitting nominations: September 15, 2015. Decision for the TT2014 ISTT Young Investigator Award will be communicated by October 15, 2015. On behalf of the ISTT, I would like to thank ingenious targeting laboratory for their support to the ISTT and, in particular, for sponsoring this 4th ISTT Young Investigator Award.